Dog Food For Chairs: Holy Nostalgia! It’s about time to give in to my temptations of inappropriate subject matter that raises its ugly if humorous head every year-ish. But before we go there, a tip of the cowl needs to be given to some awesomeness for the whole family. DC's live action films have long been focused on the Dark in Dark Knight for Batman. 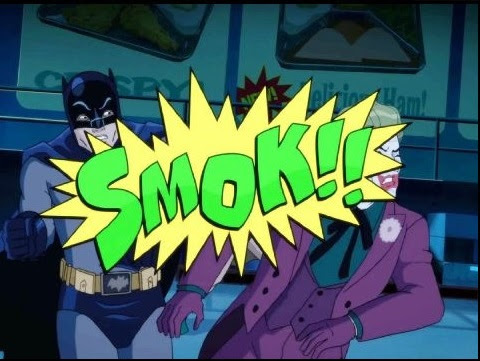 Similarly, the animated features have been moving away from anything resembling Bat-silliness in more recent times. However, for Bat-fans like myself with a sense of humor, the wait is over. 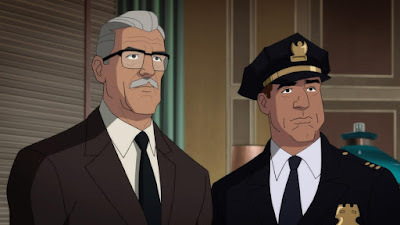 Batman: Return of the Caped Crusaders was released on November 1st, and I finally got around to watching it. I won’t put any spoilers here, because such knowledge would take away from the film's considerable magnificence for first time viewers. A wonderful 50th Anniversary tribute (there’s been a lot of those, hasn’t there?) to the 1966 Batman series. An affectionate parody, both pointing out some of the ridiculousness we all knew was there in the show, and taking the later super serious Batman interpretations down a few notches. An updating of the series, giving it a smidge of modern-ness, but mostly using animation to insanely increase the budget of what can be shown. 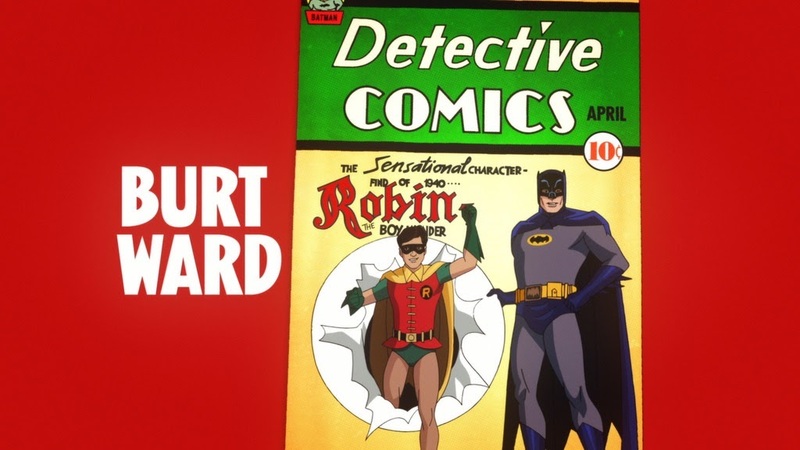 For example, the Batcave now has the Dinosaur and Giant Joker Card of the comics. 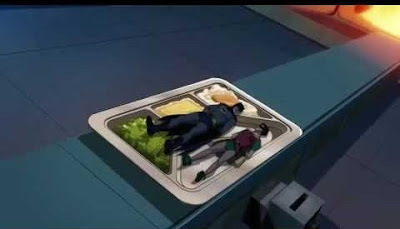 It not only pays tribute what made the show great, but recreates at a level where it aligns with all of our childhood memories of how much fun and adventure were packed into it. 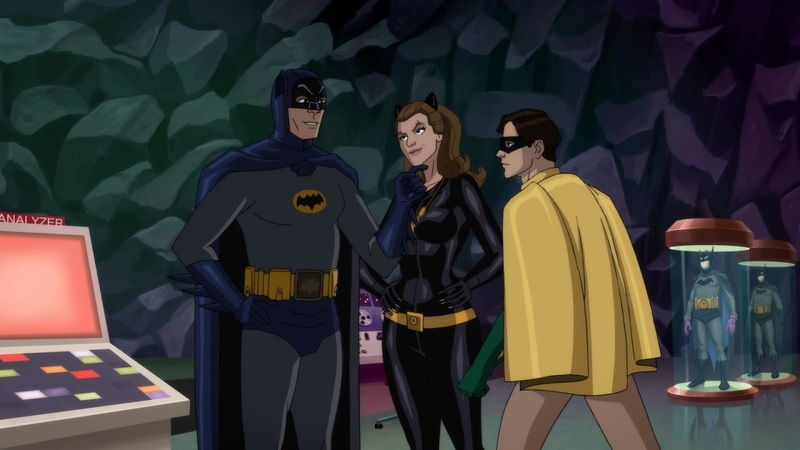 The writing and visuals were amazing, but the key is reuniting the three surviving cast members of the original show: Adam West, Burt Ward, and Julie Newmar. 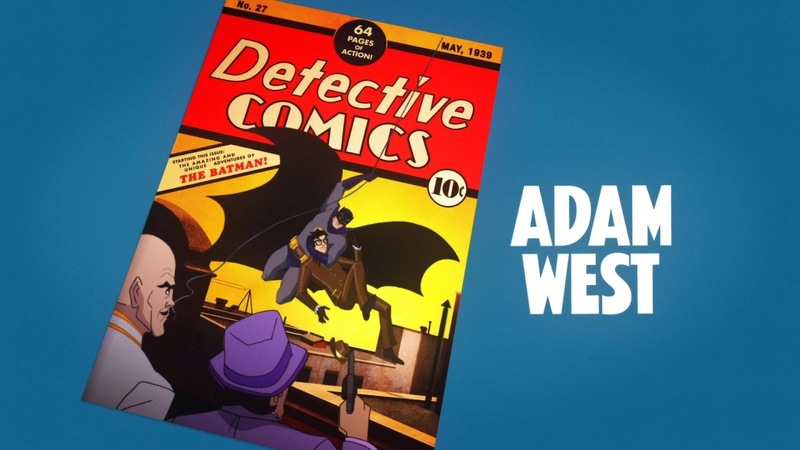 Adam West definitely sounds far older than he did, but it works in the context of the story. The path it goes down allows him to revoice some of the most iconic lines of other Bat-versions, and in those scenes, they demonstrate why going down those darker paths may have been a Bat-misstep. 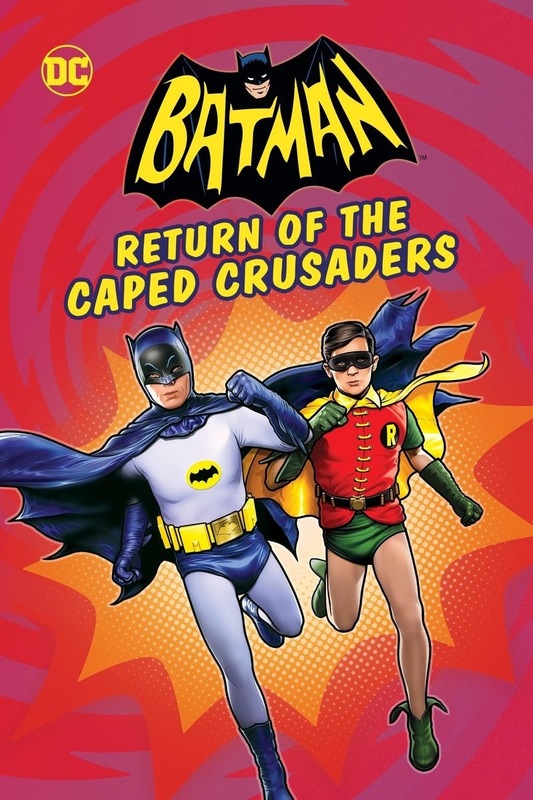 It also offers more conclusive proof that we need to forget about Bud Abbot, Dean Martin or even Margaret Dumont; and recognize that outside of perhaps Mr. Spock and Bert, Batman will always be the greatest straight man in the history of entertainment. 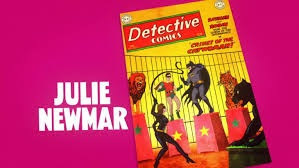 Julie Newmar sounds older as well, but her voice still has “it,” making it easy to see (or more accurately hear) why Batman strives to redeem her. The sultry arrogant temptation filled tones are still there. Burt Ward sounds the same. He’s Seventy-one, yet every “Gosh, yes” comes out with the tone and enthusiasm of his nineteen year old self. Sadly, none of the other regulars are still around to reprise their roles. The replacement cast steps up to the challenge however. Judging by the interviews in the blu ray extras, the sheer joy of working on this project with the originals has heightened their performances. Wally Wingert, taking over as the Riddler, comes the closest to the 1966 version. Basically, Frank Gorshin single handedly formed the Riddler we all know following the characters couple of comic book appearances. 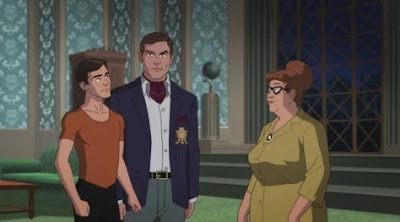 Wingert has been voicing the character in video games, giving him enough practice to make adding a bit of extra Sixties mania for this movie an easy riddle to solve. Penguin and Joker are both excellent interpretations that fit with the time of the show. They’re closer to the Filmation or Superfriends versions based on the Meredith and Romero interpretations instead of straight copies. William Salyers brings the veneer of aristocracy and style covering menace that the Penguin needs. It’s not fully Burgess Meredith’s fantastic performance, but again, it fits well in the story. Kind of like how the multiple Mr. Freeze actors all worked without copying each other. Jeff Bergman comes closer to Caesar Romero’s voice and laugh. Unfortunately, in the only real complaint I have about this production, they did not animate a mustache under the Joker’s makeup. Steven Webber, using a forced English stuffiness no doubt practiced in Dracula Dead and Loving It, does justice to Alan Napier’s Alfred. Jim Ward and Thomas Lennon as Commissioner Gordon and Chief O’Hara use wide eyed, hero worshipping wonderment for the Caped Crusaders in their roles. It’s hard to tell if it is exaggeration or recreation since Neil Hamilton and Stafford Repp in the original were no slouches in that area during the goofier police headquarters scenes. Madge Blake’s replacement, Lynn Marie Stewart plays Aunt Harriet with a more savvy kind of cluelessness than the original, but it still works. 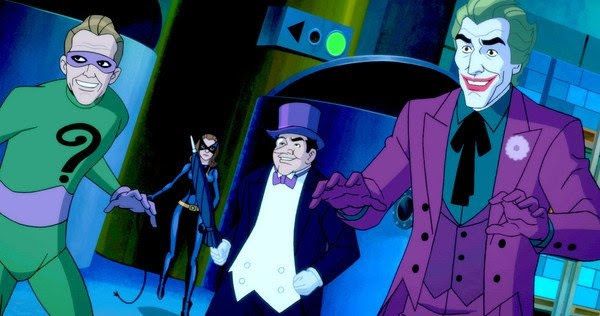 There are cameos of every Bat-villain, shout outs to Bat-history outside of the show, old favorite and new insane Bat-gadgets, printed sound effects ranging from the classic to the fourth wall breaking, and a story that shows why this version of the character will endure beyond any other live action adaptation. I heartily encourage EVERYONE to run out and buy a copy. Frankly, I know it’s not to everyone’s tastes, and a decent percentage will hate it. I don’t care, go buy it anyway. The reason is simple. In the survey I filled out from a card inside the package, it asked if I would be interested in buying a sequel to this film. This sequel they have in mind would feature Two Face, who never appeared on the series. 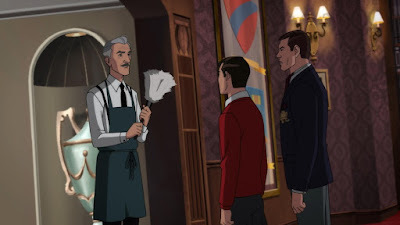 The episode he was supposed to be in was too dark, and was later turned into a comic. Two-Face was to be played by Clint Eastwood. What could be more awesome than that? In the new cartoon, Two-Face will be voiced by William Shatner. SAME BAT TIME SAME BAT CHANNEL!!!!! I believe we all would. Thought the Paul Rubens voiced version in the finale of the Brave and Bold cartoon is about as close to that awesomeness we'll ever get. Thanx for posting. I hate Batman, but I will see this! Thanx for reading and posting. My guess is you hate the often overused extra dark, clearly crazy and highly jerktastic interpretation of Batman that gets way too much spotlight these days. This movie makes fun of that version most excellently.